I have a heart arrhythmia that, though benign, is frustrating and feels like death despite its clinical insignificance. It has no cause and no effect; cardiologists call it capricious. It’s meaningless and unreasonable and irregular, and I hate it. After a night of insomnia and errant heartbeats, I spend a comforting morning on the piano with Claude Debussy’s First Arabesque. Its rhythm is purposefully unpredictable, notes falling all over themselves. I played the piano all the time when the arrhythmia was first monitored and diagnosed, drifting toward arrhythmic music I hated learning as a child. All those misplaced beats and skittering hands and attempts to hold multiple melodies in my head at the same time. It felt wrong, but my piano teacher knew: This one, she will never befriend the metronome. The arabesque is a problem that never gets solved, an unanswered question. Playing it is like endlessly falling with nothing to right the body. It is all sky and no ground. Arrhythmia is distressing in any form. 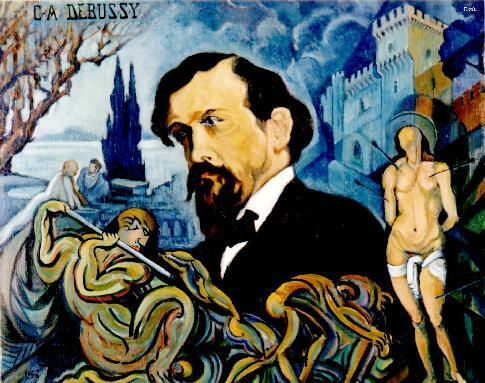 Debussy’s use of arrhythmic structure—bitonality—got his music shunned by the artistic thought leaders of the day. In nineteenth-century Europe, tone was integral to composing music, tone being a steady sound in one key that predicts and guides the composition. Haydn and Bach were the greats, the ones to be emulated: repetition leading to rhythm, a diversionary tactic here to indicate that something is happening, a return to the source soon after. Set the metronome; do not deviate. In a bitonal musical structure, different melodies climb on top of each other, and there’s no true harmony to act as home base. It must have been a compositional trip for Debussy, but it’s a special kind of hell for a musician taught to follow certain musical rules. And one effect of flouting the rules, throwing a piece entirely out of stability, is that any small shift can change everything. Enter dissonance, the small shift that changes everything. In a system thrown out of balance, all it takes is one note. A dissonant note is the note that demands a musician move on to a stable chord, the confused note that hangs in mid-air and demands resolution, creating tension and drama and a singular feeling of wrong and bad and wrong. It is the beat that feels and sounds like fear. Cognitive dissonance—our ability to believe two contradicting truths or at least sit with the discomfort of allowing them to face each other—is a bit of an evolutionary puzzle. It requires backing away from certainty to argue within oneself, or somehow learning to carry a friendly argument, and living with questions that can’t be answered. It’s a puzzle, because our survivalist brains should be accumulating knowledge and discarding that which is uncomfortable. Instead, we ponder. And we don’t just ponder: We make art to welcome and celebrate the dissonant. We have fun. In Image’s most recent issue,“Evolution and the Imago Dei,” I was surprised to find that none of the authors advocated compromise between belief in God and the mechanism of evolution. Compromise is a little silly to me: Why can’t things be entirely themselves and still refrain from obliterating each other? Whether the authors wrote of the two concepts—that of God and evolution—as friends or parts of a symphonic whole, the impression is of a question whose answer is never promised, a question to tuck away and carry and live. But how to live a question? As someone who, until recently, disdained the idea of mystery as a deliberate eschewing of knowledge, I was intrigued by Toby Twining’s essay “The Evolving Song.” Twining talks of mystery as humility before creatures and processes whose lives and journeys are not ours. He is writing of what we don’t own, and by default, highlighting our wish to regulate and control and organize and—horrible idea when applied to other beings—possess. Mystery is, in part, acceptance that we can know a little and believe and imagine, but we can’t pretend to use knowledge to have what isn’t ours. And precious little is fully ours. Arrhythmia is a question held in the body. Mine is not dangerous, but simply in error, though the idea of error without risk seems anathema. When I’m feeling forgiving toward it, I think of it as variation, and bodily variation is adaptive, yes, but also courageous: Aren’t we always so disappointed when we fall out of line with how we’re measured? Courageous, because we have to build humility to stop controlling things that are entirely themselves, things that are closer friends with mistake than with control. A well-known example of dissonance in classical music is D minor, the devil’s chord. D minor was used frequently in opera to denote that something terrible was about to happen, a trick of the scales and the ear to represent the presence of evil. In other words, it conveyed a feeling of wrong and bad and wrong. It made its listeners wish intensely for the piece to move on, quickly if possible. Dissonance sounds like pain, like grief, like dread and chaos and death. These qualities made dissonance perfect for one of its original musical uses. 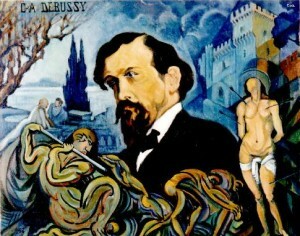 Debussy flouted the rules, but he was by no means original. The rules had been broken before they were written, arrhythmia existing before the metronome could call it out. Early religious music used it almost exclusively, because dissonance was how one talked to God. Early prayerful music—the droning chants of Catholic monks, the Sikh songs comprising sacred sounds to draw the divine out of its hiding place in the cells—was dissonant purposefully, because people got lost in it, caught in a problem that vibrated in the muscles. The first heart must have felt like holding a bomb. All those beats, like the early church bells whose clanging was intended to slice room in the air for God. And in reading the “Evolution and the Imago Dei” issue, I have so many questions: If God can be anything, can God be an uncertainty, an absence, a mistake? I saw a photo last year of a teen boy’s heart, a bullet hole in the left ventricle, and the hole cried out. If each beat carves room for God, then stopping each beat abolishes a slice of him. There is such a thing as no more room. There is such a thing as our hearts beating now, and now, and now, and….